Well, it's worth noting that Długosz was very disconnected from those times, by at some 150 years, and his descriptions aren't most accurate. In this case, the fragment doesn't really precise distance very much, only " z daleka', so from afar, from distance. So not in melee. Theoretically, long range shooting from the horse wouldn't be very practical at hitting any reasonable group of people, unstable platform, horses and riders obscuring view and trajectory, while still forming rather loose groups..
Obviosuly, theorizing about such thing is usually somehow flawed. When shooting at long range, they didn't target individual riders and horses, but shot at the area where enemy forces were concentrated, as he put it "around and on the enemy." Długosz was by no means the only person to notice this (and there were still plenty of tartars still around in his day, he knew many personally, both Lipka Tartars who fought for the Poles as well as such leaders as Haci I Giray). Fra Di Plano Carpini described the same thing, and he was around at the time of the initial Mongol invasion. In England long range archery practice was done shooting at large colored sheets staked out on the ground. The point was to get the arrows into a specific zone. I think this is one of the principle differences in fact between crossbows and bows; both were used both to target individuals and to shoot into areas in lofted shots, but crossbows had a much longer effective range for shooting individuals, especially when used with support; bows of all kinds had a much longer maximum range suitable for area shots. The latter, especially when using light flight arrows, isn't necessarily highly effective against armored troops, but not all troops are armored. Is the best range to shoot a bow at point blank? Yes absolutely if you can get away with it. Is the best range ultimately the range you can hit them but they can't hit you? That appears to be how they used these weapons in practice. I do not know a depiction of such a setting other than in stationary defence such as the Hussite war waggons. It's worth pointing out that the Hussite war wagons were not necessarily stationary, they won several battles by using their wagons in mobile columns, both during the Hussite wars and afterword fighting as mercenaries for Matthias Corvinus (against the Turks) and in Prussia (on both sides of the 13 Years War). "Whoever wishes to fight the Tartars should have these weapons: a good bow or strong crossbow (which they fear*), and enough arrows and a good axe of good iron or a hatchet with a long handle. The points of the arrows for the bow or crossbow should be tempered when they are in hot water mixed with salt, as the Tartars do, so that they should be very strong for penetrating their armor; swords and lances with a hook, which are good for pulling them from the saddle because they fall easily from it, daggers, thick cuirasses because arrows do not easily penetrate these, and a helmet and armor and other things to protect the body and the horse from their weapons and arrows. And if some are not as well armed as we have described, they should stay behind the others, as the Tartars do, and shoot against them with bows and crossbows." Another misunderstanding. Sorry, I didn't intend to suggest in any way that the wagons were stationary. We all know that they weren't. The forces on the wagons did fight stationary insofar as they are no infantry that is running around, but they stand on their spot on a moving platform. This approach to combat seems to have prevailed via war wagons for a long time in Eastern Europe's fringe to the Asian horse archers. The problem of coordination against fratricide gets simplified if people have their definite spot and loading a strong crossbow on the run would pose a whole new set of problems. This coordination was one of the earlier problems pointed out in this threat if you regard the mixed formations of crossbowmen and spearmen or the adaption of at least part of a force of crossbowmen to be engaged in close quarters combat. Moving the wagons seems to be key to defeating one of the principle countermeasures to it, i.e. cannon being set up to blast the tabor to pieces. It's interesting to me that moving columns of these also seemed to be so decisive against the Turks on a couple of occasions. I agree loading crossbows (and guns) on the move seems like it would cause a lot of problems, but they apparently did it. Not only on the wagons, but with mounted forces. Mounted crossbowmen were apparently as common in Central Europe in the 15th Century as mounted carbiners were in the 16th and pistoliers in the 17th. Nicolle has a note that in Spain, where the crossbow replaced the javelin, mounted use did have a shoulder-fasted and not a tail-belt system with a hook for loading. As the mounted crossbows seem to have generally been of the light type it was not that difficult. Eastern Europe is quite different from Western and Central Europe, they did also mount their artillery in large waggons that had some armouring effect and could be moved. Sounds pretty much like the invention of tank warfare and I'd like to see a research that goes deeper into that topic. So we figured out some more things about crossbow tactics that got lost among a plethora of energy and penetrative power comparison with longbows and Turkish bows. Crossbows were good for stationary defence in permanent or temporary defensive structures, including fortifications, wagons and ships. There was enough cover to reload under protection and use the great precision and higher released kinetic energy of the projectile for shots that count. Use of crossbows does include mounted use in Europe, especially in areas with a tradition of very mobile warfare such as the Iberian peninsula and Central and Eastern Central Europe. In the Iberian peninsula it replaced the javelin (nicolle mentions that next to the crossbow one javelin was kept ready). In Central Europe is a strong javelin tradition and I guess the crossbow fulfilled a similar role by creating a munition that was fast, inexpensive, precise and plentiful in comparison. We had the mention of mounted archers shooting at the distance of a lance that would make a javelin or crossbow a suitable weapon to counter this approach with a weapon that can reach the enemy. Thalhofer depicts lance and crossbow fighting each other on horseback under very equal conditions, so the choice for one or the other type might have been tactical within one group of combatants. This group is at least during Landsknecht warfare known as "Ringerpferd" from "geringere Pferde" meaning with cheaper mounts than traditional lance armed feudal heavy cavalry. There can be little doubt that with gunpowder replacing lance and crossbow, these became the notorious reiters. The image shown above is about combining close combat troops in close combat with ranged combat troops who have to shoot from a very close distance because of the inherent accuracy problems of early smoothbore gunpowder armament. We lack depictions other than the Hussites about a similar interaction between so-called spearmen and crossbowmen, but I guess this was a general pattern of cooperation between spear and crossbow on foot as well as lance and crossbow mounted. To what degree the ranged or the close combat equipped variant prevailed, might have a lot to do with an adaption for the expected enemy. Scandinavia is interesting because they are shown using crossbows to shower an enemy and the whole formation has crossbows. It just looks like the same tactics as often tested with English longbow yeomen, just with another tool. This does not make much sense if you take them to employ the usual short draw length high draw weight versions popular throughout Europe in contrast to for example the longer draw length Chinese concept that made the crossbow a bow on a stock that was easier to handle (but as well developed into more powerful draw weights using the feet and releasing multiple bolts for continuous showering of usually mounted archer enemies with a missile barrage). That's the issue where I'm not sure crossbow is crossbow. It's my guess that Scandinavia and possibly the Baltics did use lighter crossbows with an as long as possible draw length in their massed formations. Such a version would be similar to the Chinese idea and allow to use leg muscles, normally well trained for lifting, to release a constant missile barrage at lower economic (less necessary training time, lower missile production costs, weapon with civilian use for hunting) and political costs than the famed longbowmen of England. At least Gustav Aolph had to convince his drafted soldiers to replace their crossbows with gunpowder weapons and pikes and had it written down. Scandinavia, other than Italy, was one of the "crossbow-countries". That's the point we had before about crossbowmen appearing as high paid professionals, same as the longbowmen and both had a connection to a medium social standing and wealth with strong connection to craftsmanship. We were unable to solve the question whether the numbers of crossbowmen could be inflated by cheap help loading the weapons and carrying a large pavise in order to allow the expensive professional to focus on his core task of marksmanship. It has often been mentioned that the crossbow is several times slower in a rate of shot test than the bow. I'm still sceptic, and think that someone trained as a craftsman in piecework earnings since early childhood will achieve a different comparison in rate of shot. Add to this a difference in munition expended efficiency by the improved aiming characteristics of the crossbow and the lower missile price. This can be factors in my opinion that validate the Medieval perspectives on weapon choices and payments for their handlers. you see the crossbows mixed both with lancers (on the left and right, what look like scouts in both cases) and with gunners among the infantry, though in this case the gunners and crossbowmen are separate from the spear / halberd men. The gunwagons in the middle are not the Hussite style but are basically artillery mantlets for small field pieces, supported by gunners. The pattern of having the 'harder' wagons on the outside and the 'softer' (supply) wagons on the inside of the column does match what records report that the Hussites did. interestingly the detail layout of the axles on top matches the one in Talhoffer which I thought was copied from Belefortis. The crossbows appear to be the heavier, short-span type. From what I've read though they definitely did use several types of crossbows, and also several types of ammunition. Long range shots most often used the 'bremsen' harassing / whistling bolts. They scared horses, allegedly. I think this is one of the principle differences in fact between crossbows and bows; both were used both to target individuals and to shoot into areas in lofted shots, but crossbows had a much longer effective range for shooting individuals, especially when used with support; bows of all kinds had a much longer maximum range suitable for area shots. The latter, especially when using light flight arrows, isn't necessarily highly effective against armored troops, but not all troops are armored. Crossbows were also used for long-distance arcing shots. The Great Warbow includes unambiguous artistic evidence of this practice. Similarly, bows of any kind could be used up close for power and accuracy. That was what Fourquevaux recommended against armor and how Bertrandon de la Broquière described a common fifteenth-century Turkish tactic. Yes I agree in both cases, but crossbows were apparently less effective at this, the bolts being heavier and less aerodynamic perhaps? And also because they had a lower rate of shots, undoubtedly. On the other hand Crossbows also seem from every source I've been able to check, modern and period, to have a longer effective range for individual targets than any self-bow (and early firearms). The effective range quoted in period (Teutonic Order) sources for the middle grade crossbow is 80 meters*. I think that is longer than any self-bows. And much longer for indirect / harassing shots of course. Part of the reason for this is that you can support a crossbow on a fence, the side of wagon, and so on. Beyond that I'm not sure why. So it's a matter of emphasis, not absolutes. Obviosuly, but at greater ranges, and with such unfavorable conditions like mentioned, hitting some reasonable formation of men wouldn't be easy either. Unless we're talking formation 20 men deep, for example, but those weren't common. Really slight bork in distance, and arrow falls to far/near. Bolts were generally much stiffer for given weight, from obvious reasons, so they were spending way less energy on vibrations and similar perturbations, robbing it from energy. I'm not sure about aerodynamics - theoretically, belt shape should be less aerodynamic, but generally fletching is anyway main source of drag in all arrows, shape of the shaft isn't that important. And bolts often had slighter fletching. Only theory about crossbows being "less efficient" with long range shots I could come with, was balance. Very short bolt could in theory start spinning/waving too much while at steep angle and low energy. I'm pretty sure I recall Payne-Gallwey achieving greater distance with some self made 'shortened arrow' bolt, don't have quote right now though. Crossbows were not used by regular Swedish troops until the reign of Gustavus Adolphus, as they had been more or less replaced by firearms already during the reign of his uncle, king Erik XIV 1560-68. I might be wrong, but it was part of the early modern warfare reforms in Sweden to replace the crossbows with firearms and pikes as both were in a system that replaced the old all ranged combat. The Swedish reforms made more progress on paper than in the field, so a complete crossbow replacement can have lasted until the thorough militarization for the conquests under Gustav Adolph. I don't know what is meant by "regular Swedish troops" but they were definitely being used by Swedish militia from towns like Stockholm and Wisby, by peasants such as in the Dalarna uprising(s), and by occupying armies of mercenaries from Italy, Germany, Scotland and Spain in the employ of the King of Denmark in the 14th and 15th Centuries, and I'm sure quite a bit earlier. ... you are right the famous story by Payne-Gallwey seems to indicate a very long 'maximum range' and the image from Olaus Magnus cleary shows crossbows being used for area shots, seemingly at a very high angle indeed. There is no doubt they did use them in arced shots, but I suspect the emphasis on that particular weapon was a bit more on the precision, medium-range shot. Hard to know for sure until more evidence comes to light. But you think Długosz is a bad source? he's sort of the "Froissart" of Central Europe it seems, but almost unknown in the West, I know he is much more familiar in Poland. I just bought a copy of an English translation of his book and finding it a treasure trove of fascinating insight, especially into the 15th Century, but I'm not sure how much salt (more than a grain, surely) to take what he wrote with. Much of what he says does corroborate with other sources I have, (like the Teutonic Order and the archives from Krakow and Gdansk) but he also seems to leave things out or shift emphasis a great deal. With all these sources you have a sort of a '5 blind men and an elephant' phenomenon. He certainly has a nice writing style, at least in translation. Yes I agree in both cases, but crossbows were apparently less effective at this, the bolts being heavier and less aerodynamic perhaps? And also because they had a lower rate of shots, undoubtedly. I can agree about the rate of shooting, but otherwise I see little reason to believe that crossbows were worse than bows for long-ranged shots. Heavier projectiles would help rather than hinder the goal of inflicting serious wounds at 200+ yards. A heavy steel crossbow might well be able to pierce mail at extreme range. The effective range quoted in period (Teutonic Order) sources for the middle grade crossbow is 80 meters*. I think that is longer than any self-bows. Not by much if at all. A sixteenth-century Arabic archery manual lists approximately 74 yards as the ideal shooting distance. It identifies 177.6 yards as the limit beyond which accurate shoot becomes impossible. The former figure comes as result of that tradition's demand for a flat or nearly flat trajectory. While I consider Erik Hildinger's draw weight numbers implausibly low - the weight of the evidence suggests most horse archers drew at least 80lbs and many over 100lbs - Warriors of the Steppe does provide a useful discussion of bow accuracy. Similarly, early nineteenth-century muskets could hit an individual target up to 80 or potentially even 100 yards. Most - though not necessarily all - sixteenth-century guns would have performed somewhat worse, but we still find broad similarity in accurate range across these weapons. Within 50 yards, a skilled operator should strike true; past 100, it's a matter of luck. Of course, this ignores dodging. Assuming an initial projectile speed of 60 m/s for a bow or crossbow, a distance of 60 meters allows the target over a second to get out of the way. Any aware person with decent reflexes should be able to do this at least a fair amount of the time. Some folks can react in about a tenth of a second, so in theory they might be able to avoid a 60 m/s arrow or bolt even at 20 meters! That's probably impractical, but various Spanish accounts note how well certain Native American warriors dodged arrows. One such sources described crossbows and guns as often useless because of the swift motions of the Spaniards' Native adversaries. However, guns critically only allow dodging the shooters aim; nobody can dodge a bullet after it's left the barrel. That's likely a major reason why Native groups in North America adopted guns in the first place. As Humphrey Barwick wrote, the crossbow's design is inherently more accurate. You don't have to fool around with drawing the bow, you just hold it and aim. He's certainly great source, and one of the very 'basic' about Poland's history - it's just stuff that was happening 150 years before his birth that is bound to be less accurate. As far as "salt" goes, I wonder if there's any truth to his claim that Mongols/Tatars 'hated' salt. Gustav's son Erik became king in 1560 and not only expanded the army but also reformed the way it was armed by introducing pikemen & halberdiers on a large scale alongside arquebusiers & targeteers. New arms & armour were imported to support army expansion but when the army was fully mobilized in 1563 for the war with Denmark & Lübeck there was still a shortage of firearms. As a result old crossbows that had been sitting in storage were issued to make up for some the shortages while the Crown hurriedly purchased crossbows from the yeomen and peasants to arm the remaining unarmed men. By 1565-1566 the shortage of firearms had been solved thanks to huge shipments of arms & armour from Germany. and the crossbow once again went out of use. In 1568 Erik was deposed and his brother Johan usurped the throne in a short civil war and the army began to discard the unpopular pikes. By the 1570's most had instead settled on using only firearms or a combination of firearms & halberds. When the Swedish army invaded Livonia in 1600-1601 Count Johann von Nassau-Siegen found to his horror that there was not a single pikeman in the army and he had to improvise other methods of cavalry defence to gain the time necessary to train and arm a sufficient number of pikemen. The remainder of the Livonian war saw Swedish commanders struggling to raise an efficent force of pikemen & halberdier from the native troops only to see them get repeatedly destroyed by Lithuanian & Polish commanders. In the end most the native troops were used as garrison troops or for home defence while the infantry in the field armies was mainly made up of foreign troops who could be trusted not to throw away their pikes the first time they got a chance to pick up a firearm. Gustavus Adolphus proved to be an more effective commander than his father and managed to enforce the use of the pike in the Ingrian War and continued to reform the army after the peace of Stolbova in 1617. He had to deal with a lot of problems but the use crossbows was not one of them. The crossbow had disappeared from the Swedish army long before he was born. The Vasas were for the most part pretty obsessed with paperwork and record keeping and as a result the equipment used by the Swedish army is well documented. This makes it easy to trace the use of weapons and when they were introduced or discarded. precautions that the most perfect military skill allows for." There is a Muslim treatise on being a warrior in general, but had secifics regarding horse archery. Unfortnately I cannot find it now. But a quation is asked, "what is the best racng to loose arrows at?" And the answer was just out of range of the lance. Google up something on "furusiyya." Such a comprehensive treatise is likely to be a Mamluk one, since they're the only group in the area (after the Byzantines) who seem to have put their training methods down in writing and arranged for the long-term preservation of the documents. The theme of shooting at the shortest ranges possible is pretty consistent in manuals or guides written by actual horse archery cultures throughout the Eurasian landmass. Qi Jiguang--a 16th-century Chinese general--also stated that the proper range for horse archery is when "the enemy's weapons are almost upon you"--"weapons" in this case meaning hand-to-hand weapons such as lances, halberds, and swords. It's also worth noting that Eurasian composite bows aren't all short, stiff types designed for flight archery. Flight bows were regarded as a separate species from war bows, and the war bows themselves are often divided into two or more categories with different uses. One extreme example is the Manchu bow, which was quite long (almost as long as the archer was tall), quite heavy (the draw weight was often above the equivalent of 100 pounds), and yet was used primarily on horseback to deliver short-range killing shots with heavy arrows as the heavily armoured horse archer charged towards the enemy. One might be tempted to compare Manchu cavalry tactics with that of late medieval European mounted crossbowmen except for the fact that the Manchu horse archers weren't supporting their men-at-arms--they were the men-at-arms. Carpini mentions that the Mongols were supposed to muster with at least 3 bows, and later sources described use of a lighter, fast-shooting bow and a heavier bow - the latter either for long range or for close range / armor-piercing shots. There seems to be a theme here that bows could either be used for flight arrows / area-shots, or for close-in shots, but my best information is that both tactics were used together. The Steppe nomads had the advantage in maximum range over many of their foes (notably in Europe) which was complimentary to the mobility of their armies, so they used both to their advantage (they could keep shooting at their enemy and keep moving out of range if their enemy tried to close with them), and they also used their more powerful bows as killing weapons at point-blank range. One might be tempted to compare Manchu cavalry tactics with that of late medieval European mounted crossbowmen except for the fact that the Manchu horse archers weren't supporting their men-at-arms--they were the men-at-arms. 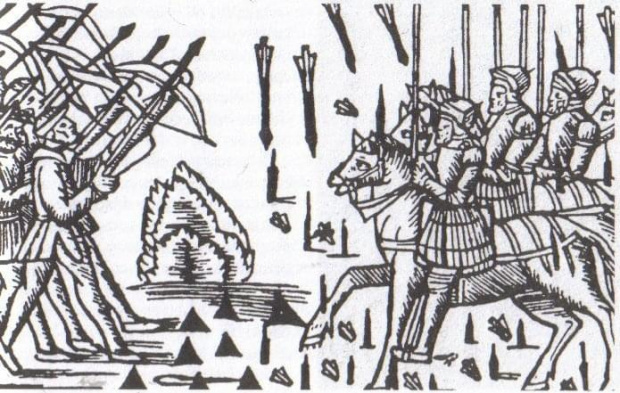 European heavy cavalry in the Baltic, including both Teutonic Knights and Poles, also used to use crossbows while charging or pursuing, and / or when disengaging. They were kept on the saddle like the pistols were later. I have recently as an untrained crossbowman (I do shoot long bow) taken part in timed shoots. 1) approx 40lb hand span crossbow made 7 shots in the minute by and untrained (longbow archer) he muffed getting the trigger in the nut on the second shot so could easily have made 8 shots in the minute. 2) I have approx 1000lb windlass bow and cycling through the full procedure takes 40 seconds on first attempt. unwinding the the windlass is the one area I can see that time could be taken from if the "shield man" could hold the claw end the archer could then pull the wrest of the rope out tight holding the frame of the axle - I have yet to try this (soon) but remember he would be trying to do this while staying behind his pavise in a semi crouched position head down (not easy). I hope to time trial a 90-100lb bow next week end with a goats foot lever I'll post again when I have the data. Try? Try not! Do, or do not. There is no try. Such a comprehensive treatise is likely to be a Mamluk one, since they're the only group in the area (after the Byzantines) who seem to have put their training methods down in writing and arranged for the long-term preservation of the documents. I do believe it indeed was a Mamluk treatise, Lafayette. Yes. When I stated the best use was almost point blank range, there was of course the distance loosing of arrows as well. It's just that the "best" range has in close, the longer range more irritants to well amrured foes (though still dangerous at distance to unarmoured horses). I think this is born out well by Crusader vs Muslim battles. The crossbows when most effective were used to keep they enemy horse archers at a distance - where they would loose many volleys of arrows that would pin cushion mail wearing crusaders, but offering little damage. There are some accounts of crusaders having their mail penetrated, and with good effect - my guess is these were usually the point blank use descrbed above. The one that would be most applicable I'd think would be loading a 300-400 pound crossbow with a belt hook. THis would seem to be the most common crossbow, these stil probably saw a fair amount of use even in later times.